Start your Thanksgiving off right with an appetizer of Beet, Spinach & Apple Salad with a pomegranate vinaigrette. Photo courtesy Butterball. This is Page 2 of a 5-page article. Click the black links below to view the other pages. 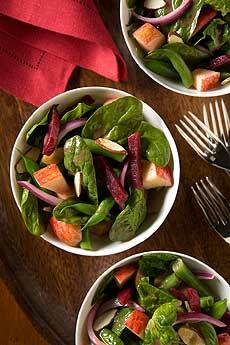 Start your Thanksgiving dinner with this colorful salad that combines fruit, vegetables and nuts, dressed with an easy-to-prepare pomegranate vinaigrette for a light and fresh holiday option. Makes eight servings. * Substitute 1 cup waxed beans for green beans, if desired. **Substitute candied almonds for additional flavor, if desired. For salad, combine all ingredients except almonds. Refrigerate until ready to serve.